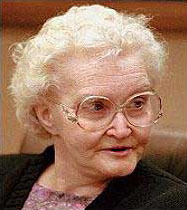 Barbara Holmes and Tom Williams purchased Dorothea Puente’s house at a foreclosure auction in Sacramento. In the 1980’s, the little old lady took in disabled tenants, killed them for any money they might have, and buried them in the backyard under her flower beds. Seven bodies were discovered and she was found guilty on three counts of murder.